Why do you like old cars? Maybe it's because you were influenced by someone; parents or grandparents. Maybe it was a natural instinct--your heart told you you cars were good, and you believed it. But for some folks, automotive passion came from playing with toy cars as a kid. And why not? It's pretty hard to resist the lure of a cool little diecast, painted in an irredescent color, ready to follow your every command. There are no traffic laws on your bedroom carpet. It's just pedal to the metal, as fast as your little arm will take it. I know I used to love playing cars. I had various sizes, so I could play with a different set of cars depending on how the mood struck me. Big cars were 1/25th-scale, so I could usually fit in a model or the rare large diecast in those chases. Medium cars were somewhere around 1/43rd-scale. There weren't as many of those, but they were still cool as something different. And of course, the 1/64th-scale Hot Wheels/Matchbox-sized cars were the favorites. That's mainly because they were the easiest to come by, and you could have lots more cars in a much smaller space. Here's an assortment of cool, old toy car commercials for your viewing pleasure. And as far as I'm concerned, these still look fun today! Man, wouldn't it be nice to have the complete set of all the cars featured in this ad montage in pristine condition today? If I had all those, I could probably quit my job for a couple of years and travel on the profits. I had this set when I was a kid, and it was absolutely one of my favorite toys ever. Basically, you yanked a ripcord out of the top of a '57 Chevy Nomad, your buddy did the same to a '57 Ford coupe, and they'd crash into each other at like 100-mph at the top of the jump ramps. Then parts would fly off. No batteries. No electricity. Just fun. Lots and lots of fun. I actually liked Matchbox cars better than Hot Wheels cars when I was a kid. It wasn't really because they rolled faster, but I thought they looked more realistic, and the axles were short enough that the wheels stayed in the wheel wells better than Hot Wheels cars did. 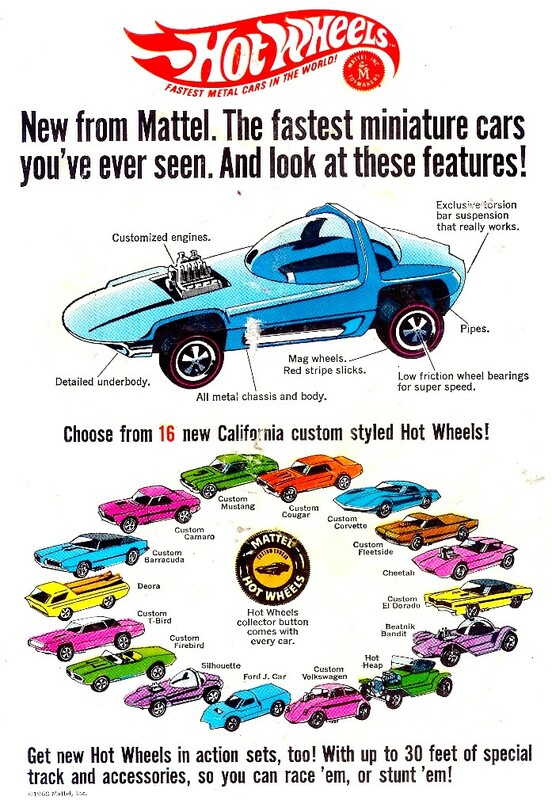 Of course, after watching this Matchbox ad from the 1980s, I'm suprised everyone wasn't so embarassed to be seen with a Matchbox car that they never sold another one. It must have worked, though, because I still have several of the cars shown at the end of this ad in my collection. When I was a kid, everything Dukes of Hazzard was big. This is an electric slot car track featuring the General Lee and Roscoe's police car. I had a Tyco track, so I never had this Dukes set, but I always remember thinking that it looked like something I wanted. Any kid that didn't have a Tonka dump truck hasn't really lived. My grandad gave me mine very early in life, so it is actually older than the one in this commercial. But this is a memorable commerical all the same. My son has it now, so I guess it really was tough. I wonder if they really dropped that truck off that cliff just for this ad. I never was into Micro Machines, but no one can forget their 1980s advertising campaign with John Moschitta, the World's Fastest Talking Man. I always wanted that Nomad, and is that a Chevette I see in there? I had a couple of Stompers, and they usually ended up stripping the gears out or something. They really didn't seem to last very long. Maybe I was doing it wrong. This one is a little older than the theme here today, but I couldn't find an ad for promotional models or anything, so this one comes pretty close. I've seen these Mustang toys for sale a few times, but never owned one. It always looked like it would be fun to have, though. OK, that's all for today. This is making me want to get some of my old toy cars out of the closet now. BHo might have to take a break from his DS or whatever that thing is for awhile. We're going for a drive! Gee, how come no pics or commercials from the 50's? Did they even have TV or pics back in the 50's? There. Beat you to it, loser.